This was my first time ever going to E3, and can I just say, it was an absolute blast!!! 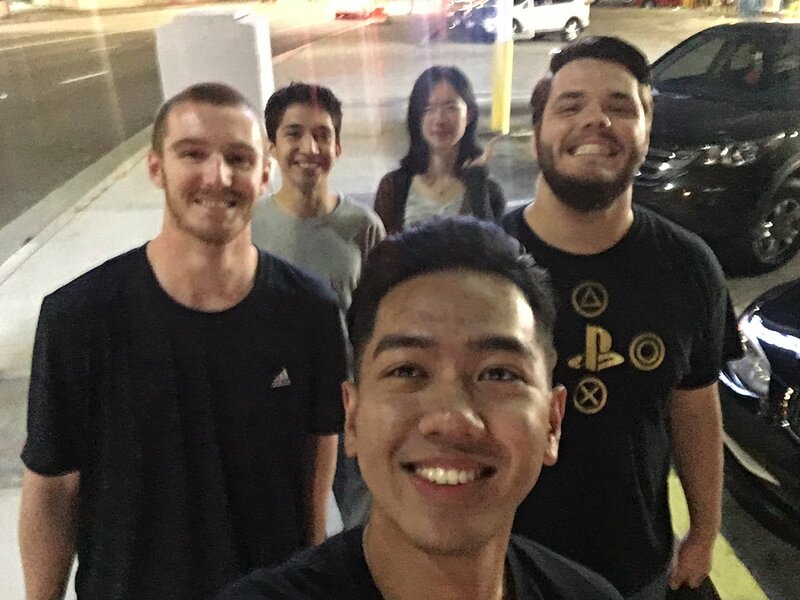 I am so very thankful and grateful that Playstation took all us interns to E3 and treated us like rock stars while we were there! 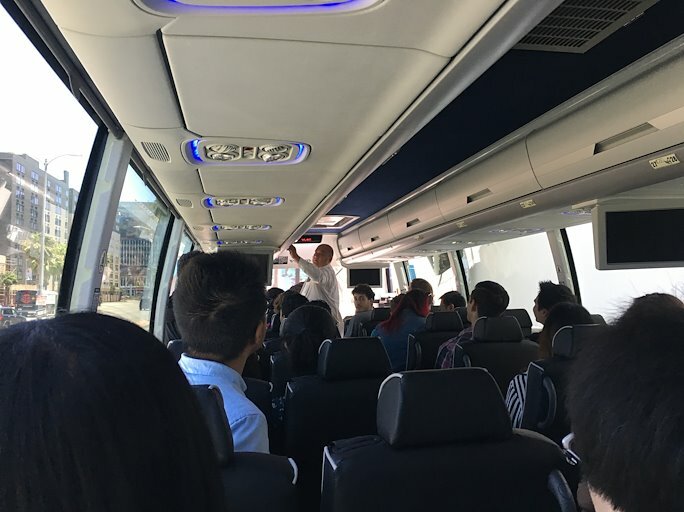 We had chaperoned bus transportation, our own hotel rooms, catered breakfast, lunch and dinner, and industry passes to E3! Really not much more you could ask for. Day 1: We all arrive at the hotel and immediately get treated to a catered lunch in one of the banquet rooms. Then we get our room keys and meet our roommates. After some quick r&r we all hop back on the busses to downtown LA for some ambiguous “team building”. They didn’t tell us what we were going to do, but to be safe, I decided to dress in more casual comfy clothes. 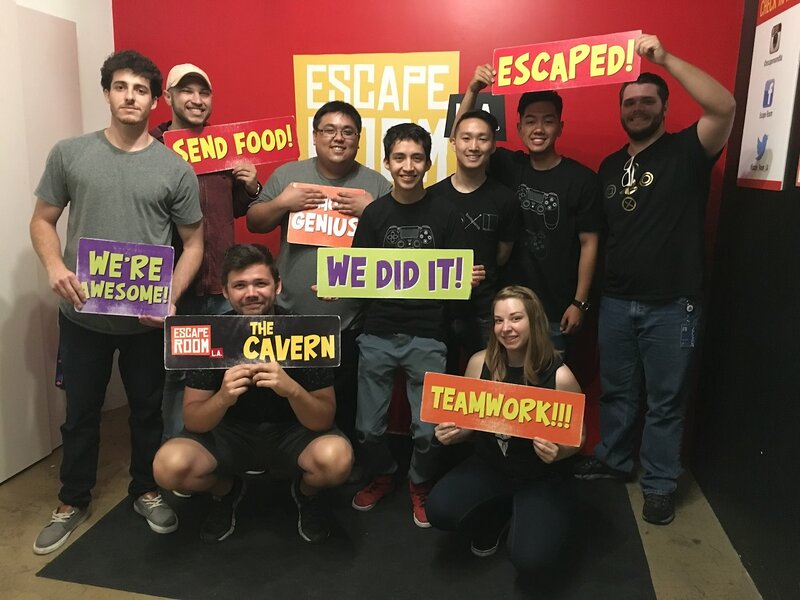 That turned out to be a good move since we ended up forming groups and got to do an escape room at Escape LA! 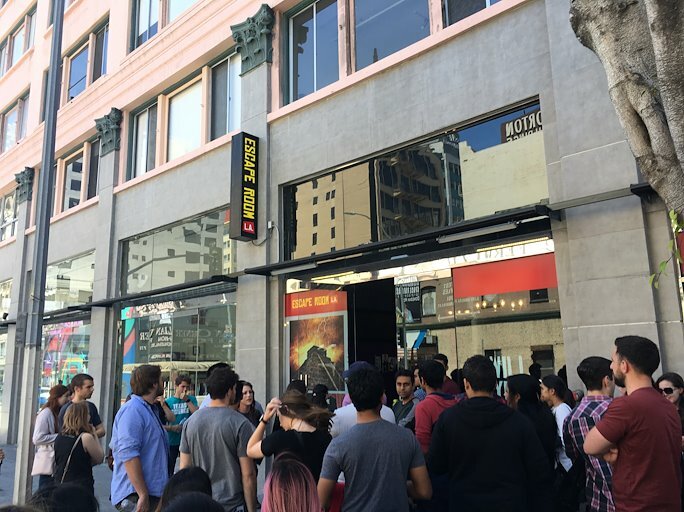 Seriously, these escape rooms are the funnest. They’re challenging yet hilarious and you and your team stumble across themed rooms to solve puzzles and riddles and escape in 60 minutes. Not many teams made it out, but ummm, OUR TEAM DID!!! And with only 7 seconds left! (Peep the picture of our team) We then did a team-building exercise to create and pitch a quick game. 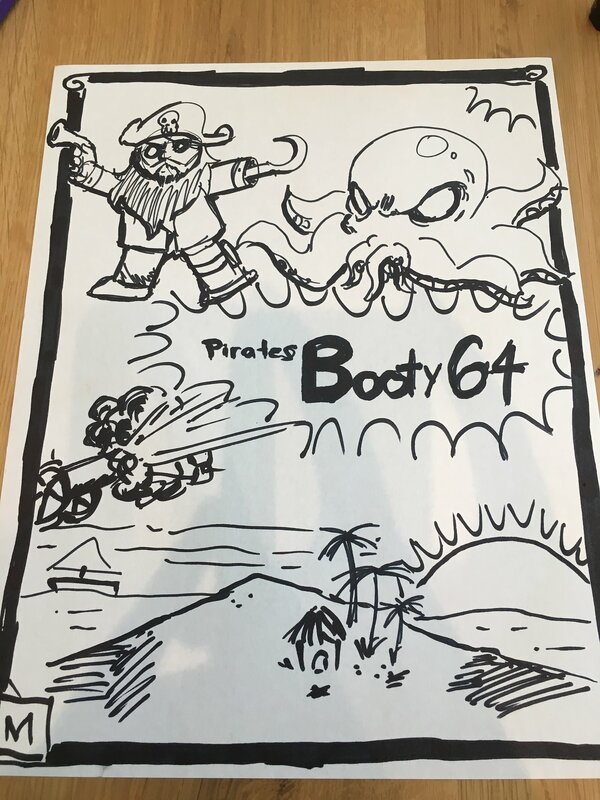 Our team made “Pirates Booty 64” and won 2nd place in voting for teams to be greenlit! 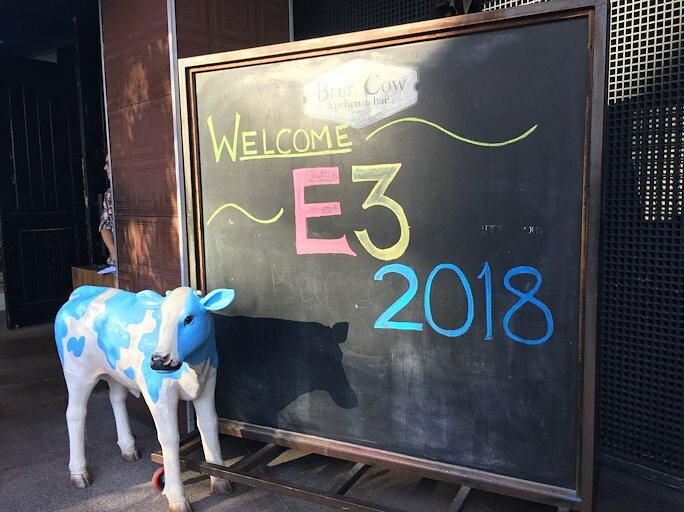 We were then treated to dinner at the Blue Cow while getting a chance to watch the Playstation E3 presentation on a live stream. By the end of the day we were all pretty drained, and ended the night lounging around in one of the rooms, playing some Jackbox and recounting all the fun we had on day one of E3 2018. 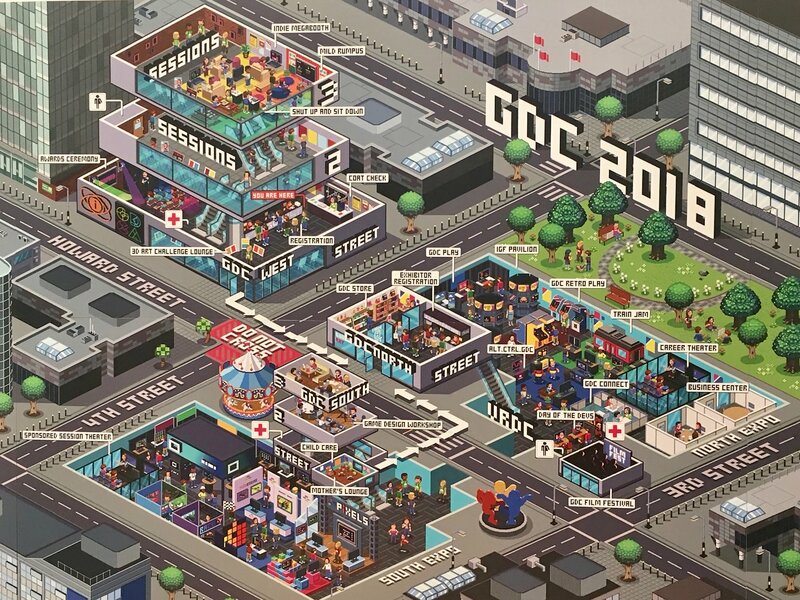 Here’s the rad map they had for GDC 2018! If you asked me what games I’m most excited about, I would say VR games. Last year, I spent six months developing a VR indie game called Sa Mata ni Nelya. 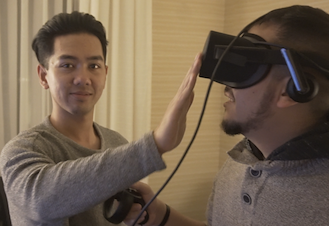 Though a rough but extremely rewarding learning experience, our team delved into the burgeoning world of Virtual Reality gaming and I can tell you, developing for VR is a whole other beast. 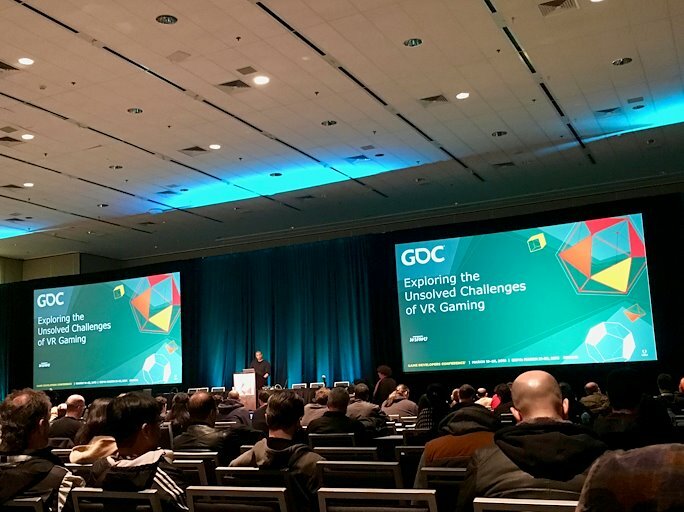 I came to GDC 2018 this year cautiously optimistic for the future of VR. This session was very eye opening and insightful. In this session, part of the VRDC Add On, Kevin Harper from ustwo games explores the various challenges inherent with VR gameplay. With concrete examples and demos, he explores how to rethink developing and prototyping for a medium unlike any other. 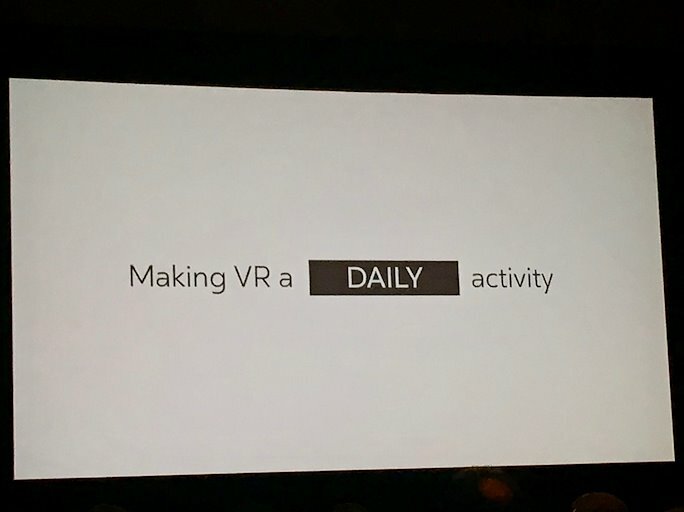 Kevin Harper gave us this hashtag, inspiring us to make not 1 week, not 1 day, but 1 hour VR prototypes. With these quick prototypes, more questions can be tackled and more productivity to arise from it in finding solutions to common VR challenges. As stated earlier, designing for the medium of VR is not the same as designing for the medium of console or PC games. We tend to go with what we know. And from that mindset, our first VR problem arises. There are too many PC and console games getting ported to VR and are not successful. Why? Because they are not designed for the medium of VR. But teleportation doesn’t work with games set in certain genres, like a Western. Teleport works for sci-fi type games. What were some solutions to this? There is also the problem of correctly emulating the handling of real-life objects and items, such as a rifle in VR. For two handed rifles, pivot point should not be two hand controllers, but at the shoulder. Moving on, we find that there is an incorrect logic thinking that limitations were VR, when in fact, the limitations were in the thought process. We need to mold our thinking toward the medium of VR. Over the course of the session, Kevin Harper outlines a couple other VR problems. 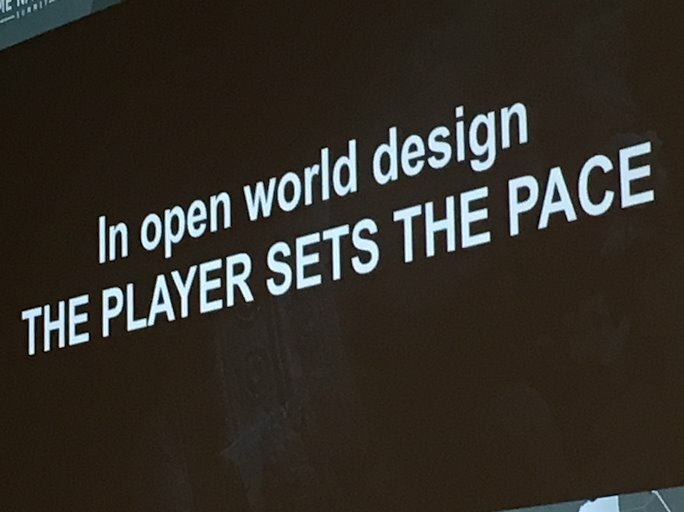 Overall this talk inspired me to rethink my design approach to VR. 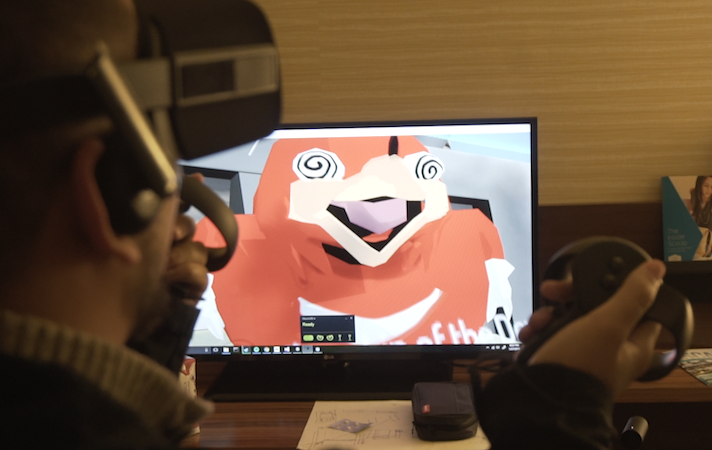 VR is unique. It is a medium that has been given to us developers and with all the excitement, we look like kids driving a brand new Tesla. We don’t know how to use it but we really want to. We have to be patient. We have to take risks and be open to new possibilities and ideas into how we can develop richer, more profound gaming experiences in VR. Otherwise, it’s going to turn into 3D glasses. Everyone said it was the next big thing but after a few years, no one really cared for 3D anymore. If there’s a class I wish I paid more attention in, it would definitely be my creative writing classes. 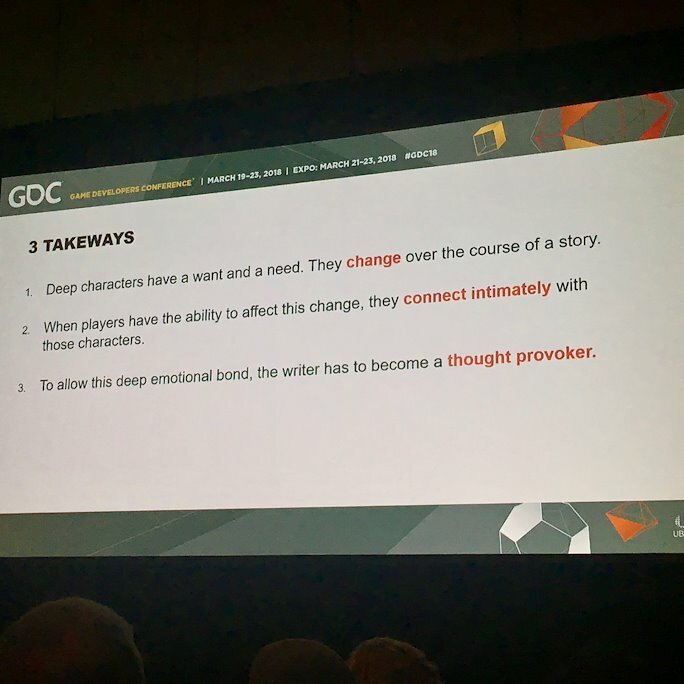 When I discovered I not only loved to consume narrative games and content, but also create them, I realized that the fundamentals of story-telling, character arcs, pace and whatnot, were all becoming very relevant from these writing classes. 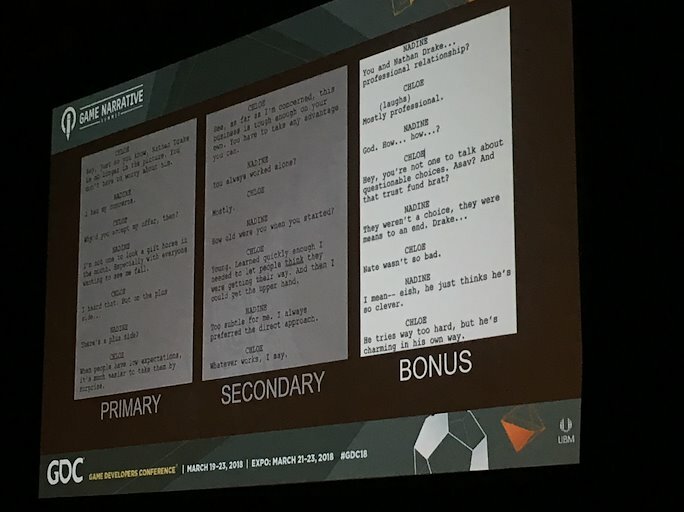 This Game Narrative Summit session goes over character development in film, television, and games. 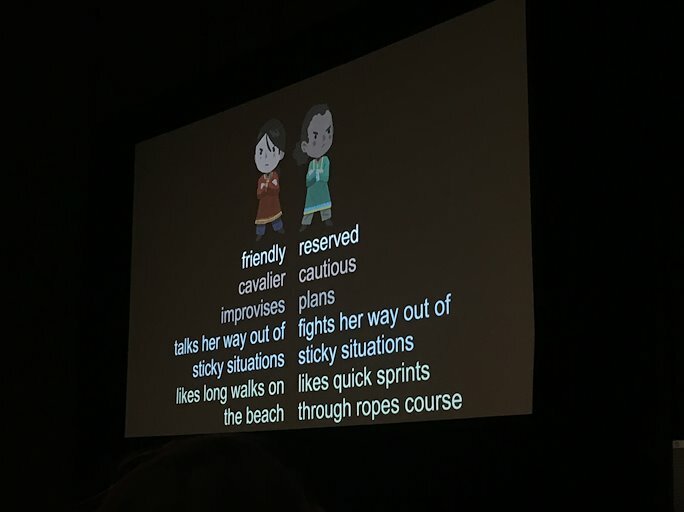 Led by “Heavy Rain” Lead Game Designer Caroline Marchal and BBC Drama Producer John Yorke, this session goes over the thought process and observations for creating characters that empower players for maximum emotional impact. What allowed me to get the most from this session were the speakers bringing in references to dissect and discuss. 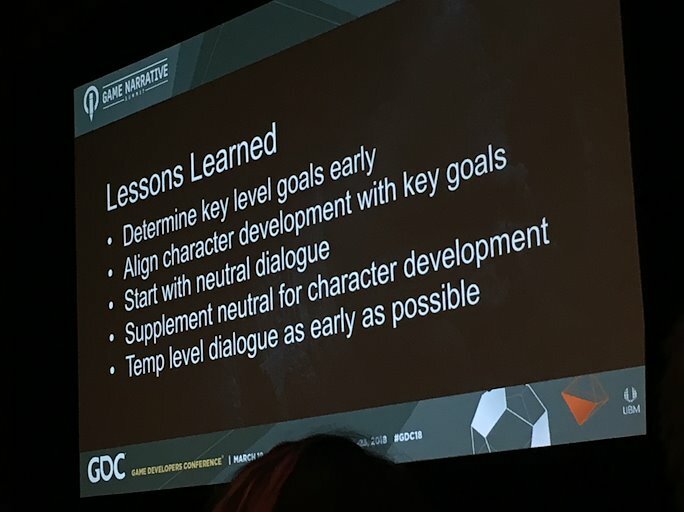 I find that a lot of times, some GDC talks bring up these conclusions and ideas that can be hard to follow without concrete examples. 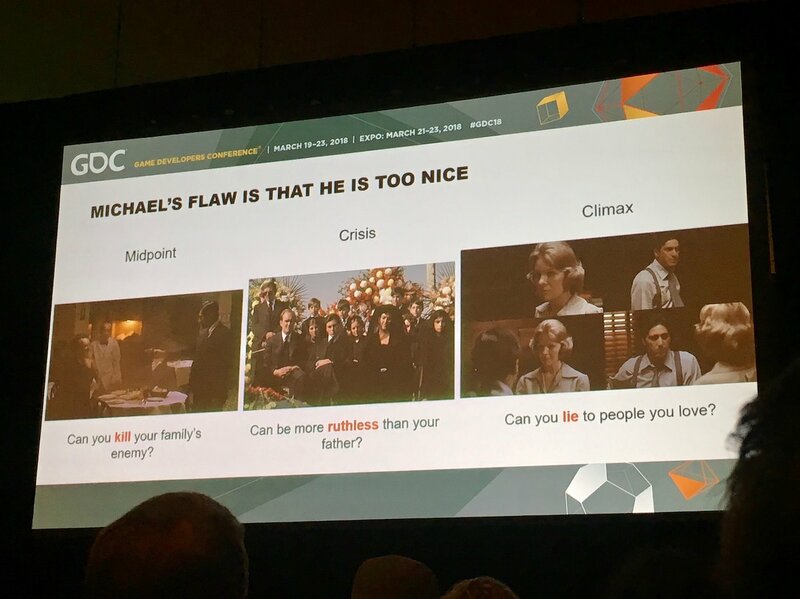 For this talk, some of the characters they brought up were Walter White from “Breaking Bad”, Michael Corleone from “The Godfather” and Joel from “The Last of Us”. Some of the ideas they discussed included how all characters have a desire, or a simple specified goal. And from my understanding, the simpler the goal, the easier it is for the audience to understand and empathize with. This desire however, is actually two desires occurring simultaneously: internal and external. With these two desires there can arise conflict. Characters who experience internal change thus have both a want and a need. These two are not always the same. BUT WAIT, there’s also one thing that brings the character to more human dimension, adding more depth…FLAW. Joel saves Ellie despite having to lie to Ellie. He gets what he’d wants but not what he needs. He changes for the worse. So continuing along, here’s more of what I learned. Have a want, to survive, kill, etc. Another interesting finding from this talk was the idea of branching narrative and multi-arch protagonists. In traditional storytelling, there is only one arc possible per character. The problem. If player’s can influence the character’s arc, they’ll create inconsistencies and mess up the story. Players can only influence superficial changes, not deeper changes thus agency is essential in truly profound interactive games. Because games are a series of meaningful choices. BIG QUESTION: how can you use players’ agency to deepen the story instead of destroying it? In any story there are key turning points that affect character change. Note: Usually happens in Act 2 or the midpoint, aka turning point. Turning point asks the question: will the protagonist overcome their flaw? Okay, so I got kind of sloppy as I started dissecting my notes and barfing out my findings into this blog post, but I hope there’s some useful information to be learned. I’ll end with one quote from this session. I love games with rich stories and profound narrative content. When asked which narrative games are my favorites, there’s no other studio that I look to than the incredibly amazing and successful Naughty Dog, creators of the exhilarating Uncharted series and The Last of Us. 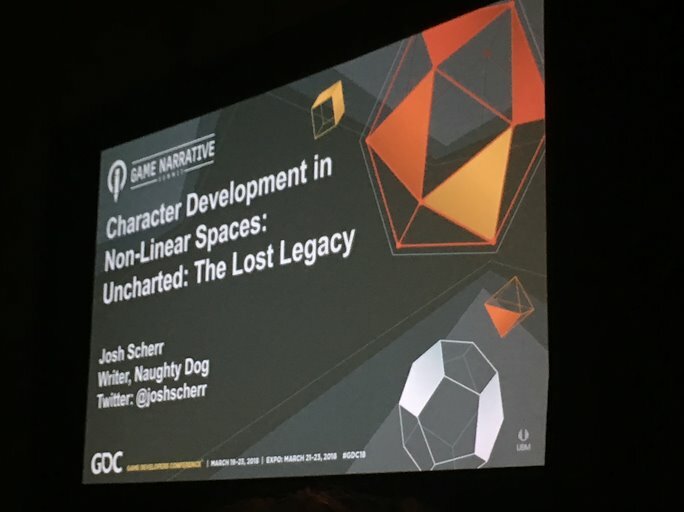 In the Game Narrative Session presented by Naughty Dog writer, Josh Sherr, we essentially get a rundown of character development and narrative design, specifically for open world, non-linear design. 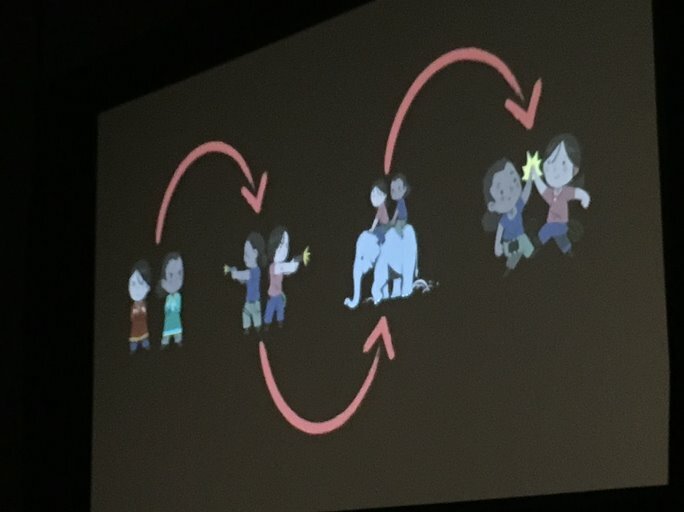 I’ve always been passionate about Narrative Design (and had the chance to do some narrative design on Sa Mata ni Nelya last year) however, I’ve never quite had a grasp of the fundamentals when integrating narrative content, story, and characters into the gameplay. What I learned most from this session was a better understanding of narrative tools (ie. 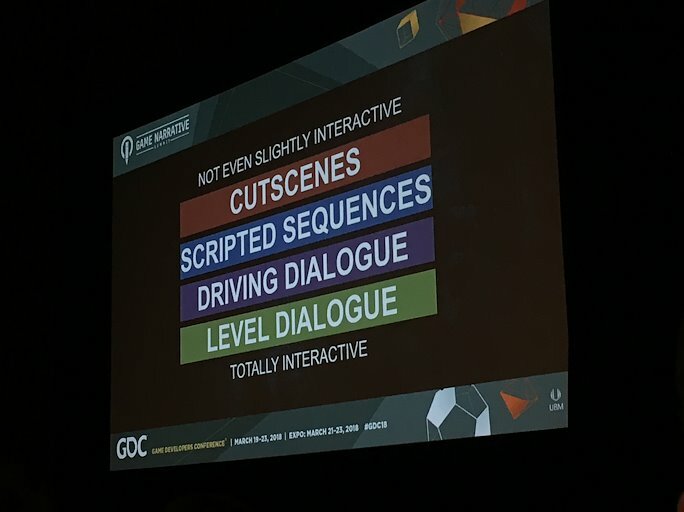 cutscenes, scripted sequences, driving dialogue, level dialogue) and how they are best applied to gameplay, in addition to a set of concrete lessons and steps that are crucial to developing your characters and progressing the story through gameplay. Be sure to check out the pictures posted of the great material Josh had on his slides. 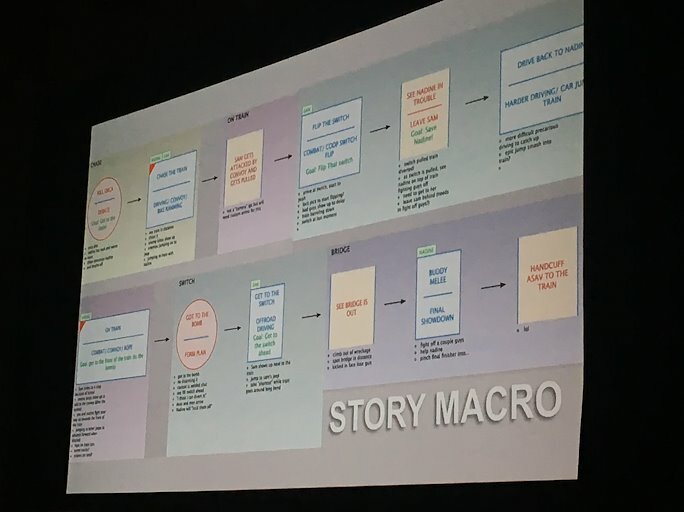 The Game Narrative Summit is my favorite of all the summits, and Josh Sherr gave an excellent talk on Naughty Dog’s processes for great narrative design, as well as the challenges faced on the journey to developing great characters and stories for games. 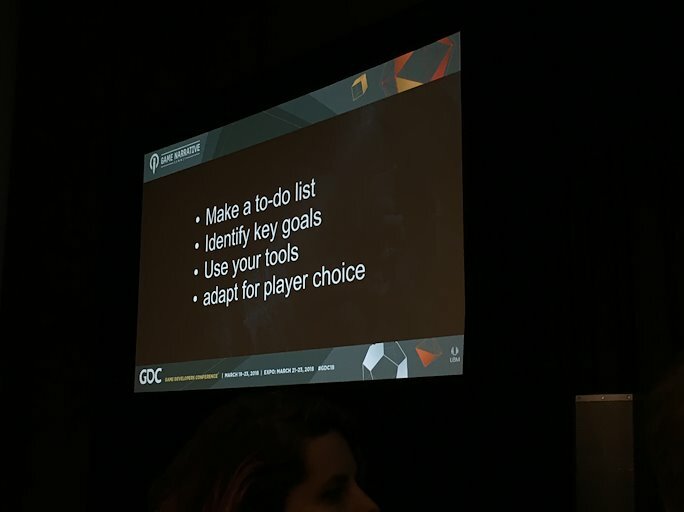 It’s been a couple weeks since an amazing GDC 2018 and I’m finally getting the chance to go through my pictures and notes to recap what I’ve learned! 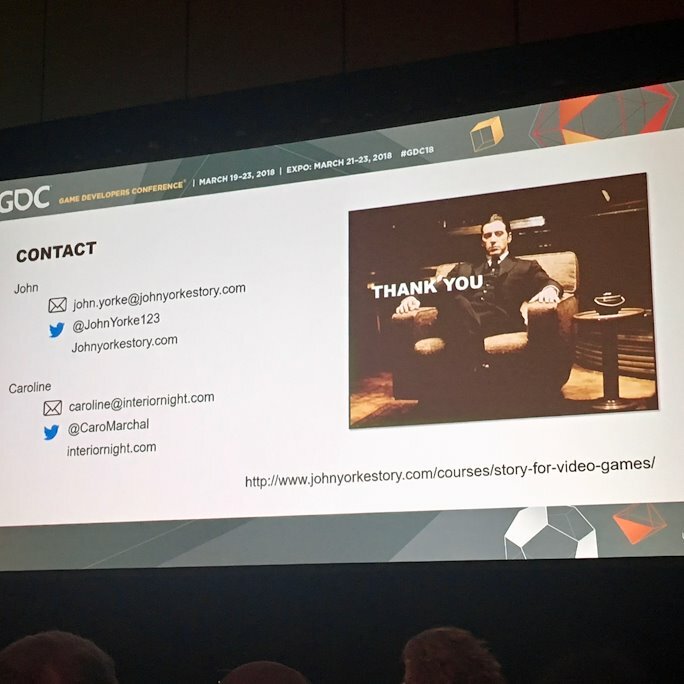 I’m going to do a short GDC Rewind so stay tuned for my recap of the sessions and talks I attended ranging from VR to Digital Humanities, Narrative Design to Level Design, and much more! 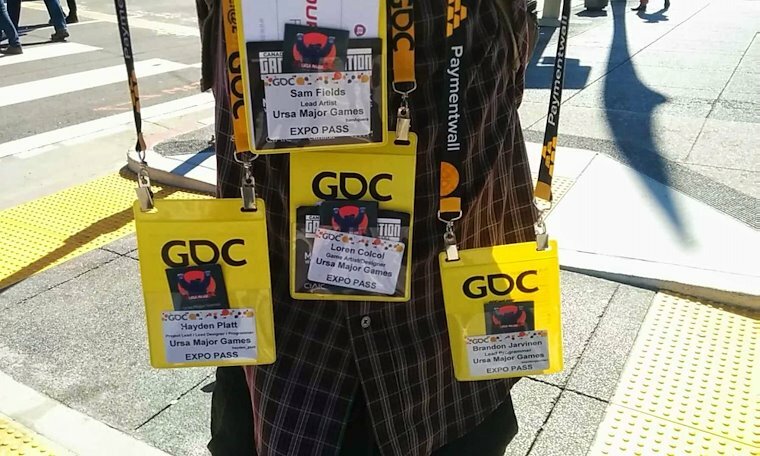 GDC 2018 is in two days so I’m having a sudden burst of nostalgia from the first time I attended 3 years ago. 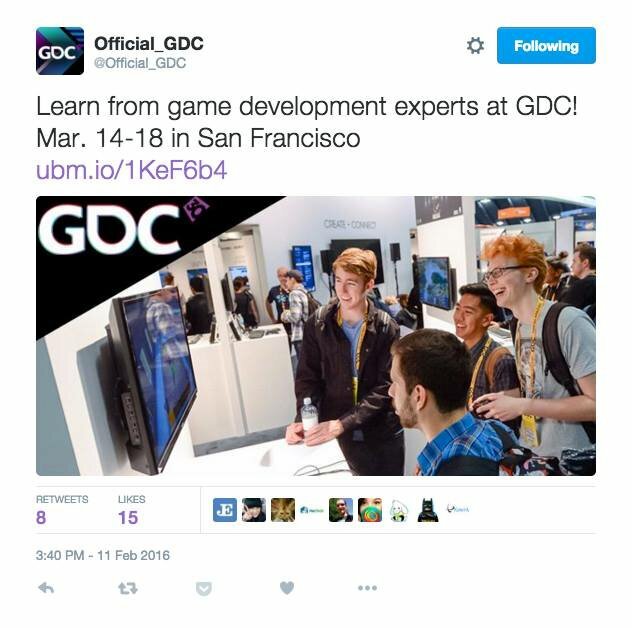 Boy does time fly… Can’t wait to get inspired and learn from other game developers! Video of our weekend at Global Game Jam. 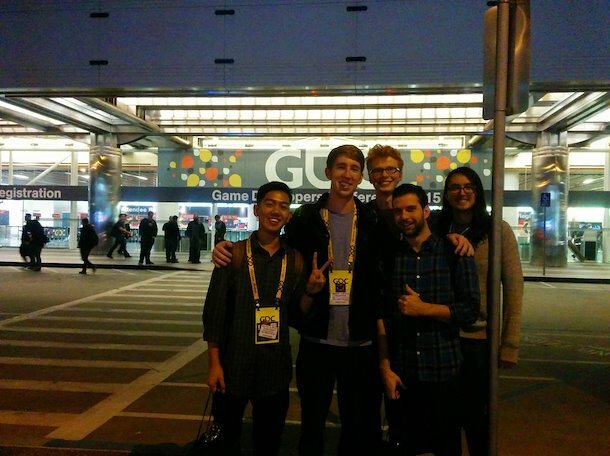 Last month, my friends Oliver, Bryan and I took a trip down to Santa Cruz for the Global Game Jam. With 48 hours to make a game under the theme “Transmission” we stocked up on the Yerba Matte (Santa Cruz brewed caffeinated tea), packed our bags and hardware and headed out to the Cruz. Bryan and I had plenty of experience developing for Oculus Rift in Unity, but with a game jam, we were really pressed for time. After an hour or so of setting up our equipment and getting settled in, we came up with an idea to basically create a Mirror’s Edge/Assassin’s Creed experience in VR. To match the theme “transmission”, we added the objective to climb up a radio tower to activate a transmission switch while dodging falling obstacles. 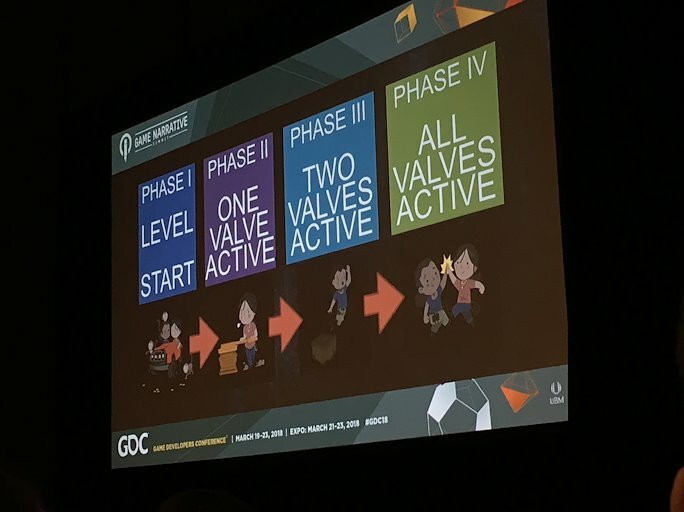 I tackled the level design and assets and Bryan began implementing the mechanics. As we were developing I was reminded of just how fun it was to develop games with likeminded passionate people. This short but sweet experience was a blast and we came out of it with a fun little demo. I’ll post the game up soon for those interested in trying it out. BE WARNED. You may or may not see some characters from Sa Mata ni Nelya. I wrote this about five years ago, when I first created my website. It’s crazy to think that through the years, I’m still building on the same vision and goal I had since I first came into college. Here’s to the future of game dev! Growing up in Southern California, I’ve come to know two things. Great weather and great entertainment. 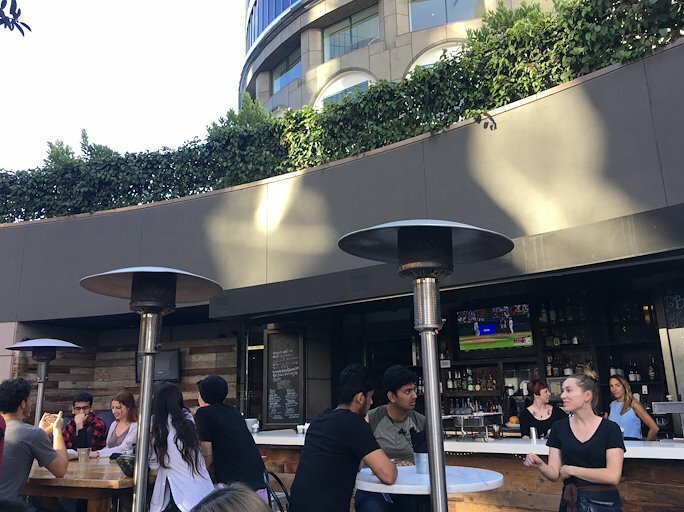 They say Los Angeles is the entertainment capital of the world, and for good reason. We have Hollywood, the Lakers (though they’re not so great this year), and a plethora of production studios (Disney, Warner Bros. and Paramount to name a few). But in the last ten years, one industry has not only boomed exponentially in the entertainment industry, but is thriving in a Digital Golden Age. I guess you can say I was born into the generation of technology and digital media. I witnessed the boom of the Internet, the Smartphone, and Social Media, but what stands out most to me from the the digital boom, are video games. Since I was a kid, games were not only a source of entertainment, but of imagination and inspiration. From playing Super Mario Bros at age 4, to recently completing the masterpiece, The Last of Us, 16 years later, games are pushing boundaries as an interactive medium. They’ve put players on the run from vicious zombies, behind the wheel of sports cars on European speedways, and in the shoes of the greatest basketball players of all time. But what sets games apart from books, music, or movies, are that they require interaction from the user, and that interaction can be as intimate emotionally as it is technologically. I’d be lying if I said I didn’t cry at the end of Shadow of the Colossus, or jumped for joy after completing Super Mario 64. It’s moments like these where I sit back and realize that games have not only affected me and shaped me as a person, but are shaping the world around me. As a revolutionary form of media, games are touching the lives of people all across the globe, of all ages, and I honestly believe that we’ve only scratched the surface of their potential. Games can be more than entertainment. They can solve real-world problems through simulations, teach us through puzzles and creation, and they constantly remind us that anything is possible. That we have the power to use this technology to change the world. I think I understand what games can do for mankind, and like anybody else, I have a dream. I wholeheartedly believe that it has something to do with video games, and whether it’s using them to teach, inspire, or entertain, I have a passion for games that I want to share with the world. The future is now. There’s no going back, and I’m putting my best foot forward. I thank my family and friends for their love and support, and especially God for his guidance. So here’s to making dreams come true, and here’s to the future of video games.